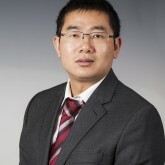 2015-2017, Shale resources characterization by integrating seismic and petrophysics data analysis, China State Key laboratory of Oil and Gas Reservoir Geology and Exploitation, Oversea Expert Project. Grant number, PLC201401, PI. Zhang, B., T. Lin, S. Guo, O. E. Davogustto, K. J. Marfurt, 2015, Noise suppression of time migrated gathers using structure oriented filtering, Interpretation (under reviewing). Lin T., Zhang, K. J. Marfurt, D. Chang, S. Zhan, and Z. Wan, 2015, Geometric attribute estimation using data-adaptive windows, Interpretation (under reviewing). Wen, X, B. Zhang*, W. Pennington, Z. He, 2015, Relative P-impedance estimation using a dipole-based matching pursuit decomposition strategy, Interpretation, 3, T197-T206. Zhang, B., T. Zhao, X. Jin, K. J. Marfurt, 2015, Brittleness evaluation of resource plays by integrating petrophysics and seismic data analysis, Interpretation, Interpretation, 3, T81-T92. Zhang, B., T. Zhao, J. Qi, K. J. Marfurt, 2014, Horizon-based semi-automated nonhyperbolic velocity analysis, Geophysics, 79, U15-U23. Zhang, B., D. Chang, T. Lin, K. J. Marfurt, 2014, Improving the quality of prestack inversion by prestack data conditioning, Interpretation, 3, T5-T12. Zhang, B., Y. Liu, M. Pelissier, N. Hemstrat, 2014, Semi-automated fault interpretation based on seismic attributes, Interpretation, 2, SA11-SA19. Qi, J., Zhang, H. Zhou, Kurt Marfurt, 2014, Attribute expression of fault-controlled karst – Fort Worth Basin, TX – A tutorial, Interpretation, 2, SF91-SF110. Zhang, B., K. Zhang, S. Guo, K. J. Marfurt, 2013, Non-stretching NMO correction of prestack time-migrated gathers using a matching-pursuit algorithm, Geophysics, 78, U9-U18. Zhang, K., Y. Guo, Zhang, A. M. Trumbo, K. J. Marfurt, 2013, Seismic azimuthal anisotropy analysis after hydraulic fracturing, Interpretation, 1, SB27-SB36.